On a recent trip home to South Jersey, Sandy Ordille visited her childhood home. The old tree in the front yard was still there, as well as her name in its bark, which she carved as a girl. She also noticed a surfboard in the yard. “I was glad to see my old home was in good hands,” she says. Home is important to Sandy, whose love for surfing has taken her around the world. She started surfing in 1963, but it was a session with her big brother, Pete, in 1967 that Sandy, then twelve, remembers most fondly. Pete let her borrow his new 9’6” Hobie and told her to follow him to the outside. “I remember looking at the big rocks of the jetty and trying not to let my brother know I was scared. A set started forming and Pete shouted, ‘Go, go Sandy!’ It was a nice two-foot left, and I rode that wave all the way to the beach.” Next thing Sandy knew, she was competing in ESA championships and on the Women’s pro tour. 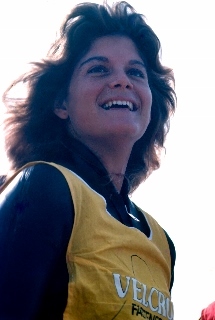 In that time, she settled in La Jolla, California, where she became a member of the legendary Windansea Surf Club. After a fourteen-year stint in Kauai, Sandy returned to San Diego, where she remains today. Yet time hasn’t faded her love for home—every once in a while, especially in the fall, she can’t help but check the Ocean City wave report.